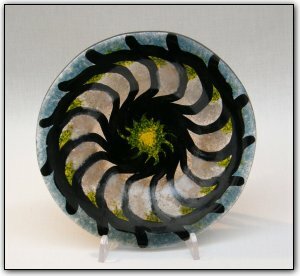 This unique piece of fused glass art was made in Paris with Bullseye Glass by French artist Delphine and features shades of steel blue, aventurine green as well as mother-of-pearl fused into the glass. They are fused together to recreate the depth and the movement of an imaginary seashell. The aventurine and the nacre glitter beautifully as the piece comes to life in the light. The parts of colored glass are fused together in the first firing. The one-piece fused plate is then kilformed on a mold during a second firing. This final step allows the colors to be revealed in their deepest and most beautiful shine. Make sure to zoom in to see the intricacy and depth in the photos, and it looks even better in person!